Are you looking for another way to celebrate your youngster’s birthday, without spending a lot of money? Now, imagine that you could host this inexpensive birthday theme party, invite as many guests as you would like, and make the whole event look like it cost a million bucks. Are you more interested, now? Well then, a Backyard Water Carnival may be the perfect children’s theme birthday party for you. This type of children’s party takes advantage of the things you already possess, but puts a new, innovative spin on your everyday items, to create a summer wonderland that’s perfect for preschool and elementary school aged children. This party succeeds by utilizing your existing outdoor toys and play sets, creating some additional activities from inexpensive materials, and punching the whole thing up a few notches by incorporating lots of water! You’ll create activity stations based upon the equipment that you already have. Use the following ideas as guidelines to personalize your event. Water Slide: Run hose to the top of your swing set’s slide, and turn it on to a constant stream. You may want to place an inflatable pool or shallow plastic pool at the bottom of the slide, to catch both the water runoff and any overzealous guests! Bulls Eye: Create a fun game of accuracy using only a piece of plywood, a handful of nails and lots of water balloons. Paint a cartoonish figure onto the plywood and drive nails through the picture at key locations. Drive the nails from the backside of the wood, so that you’ve created spikes on the front of the graphic and stand the plywood upright against a fence or wall. Have a large supply of small-sized water balloons available, and mark off throwing lines at 5 foot increments from the plywood. 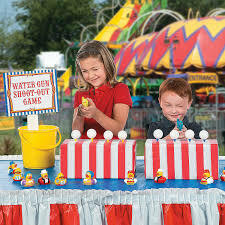 The object of the game is to throw a water balloon at the target and burst the balloon on the spikes. As the balloon is thrown from further distances, the guest can earn higher scores. Water Fight at OK Corral: Create a duel using water guns. Pair off the guests and set them up in a quick draw contest. The winner of the duel is the guest who successfully douses the other duelist first. To make it more competitive, only count “direct hits” that successfully land on the chest. You can have the duelists wear dry, red T-shirts, and the direct hits will show up clearly on the shirts. Before the party, practice this activity and adjust the number of steps your duelists should take, based on the accuracy and range of your water guns.